Practice makes perfect. That includes the ability to accurately fire some of the biggest, baddest, and deadliest weapons systems in the US Navy. But since the indiscriminate shelling of passing ships is generally frowned upon by the maritime community, here's what US sailors take aim at instead. The US Navy has long relied on radio controlled drones, like the MW-36A aerial drone or pilotless firefish, for bombing and gunnery exercises and, before that, used older ships no longer fit for combat for target practice. Today, the Pacific Targets and Marine Operations Division (PTMO) handles the operations of all airborne and seaborne targets used by the Navy. The division operates out of Naval Base Ventura County (NBVC) at Point Mugu and Port Hueneme in Southern California and runs the targeting logistics at Point Mugu Sea Test Range and Southern California Offshore Range near San Clemente, as well as a number of open ocean events. From modified jet skis to remote controlled cargo ships, if the US armada needs to shoot it, the PTMO will supply it. These seaborne targets come in two varieties: powered and towed. The powered targets are designed to look like actual ships, skiffs, or fast attack boats. Towed targets are little more than glorified barges but are much more easily repaired/replaced than their self-propelled counterparts. The QST-35 is a multi-purpose SEaborne Powered TARget (SEPTAR). It's a 56-foot-long fiberglass hull powered by four gas-fed V8 Mercury Marine engines. It has a top speed of 12 to 30 knots (13 - 34 MPH), depending on the ocean conditions. While it can be piloted by a crew on simulations or when towing unpowered targets, the boat is controlled remotely during live fire exercises using the UHF-based Integrated Target Control System (ITCS), SeaCAN, Portable Command and Control Unit (PCCU), or the System for Naval Target Control (SNTC), depending on which government agency is attempting to blow it up. The QST-35 does more than just putter around in the water, waiting to sink. With the addition of supplementary augmentation systems, such as radar simulators, RF/IR emitters, chaff dispensers, and electronic warfare modules, the QST-35 can appear on a ship's scanners as a much bigger vessel up to 40 meters away. It also, on occasion, has even been used as a mine countermeasure. Slightly smaller than the QST-35 but nearly twice as quick, the Fast Attack Craft Target (FACT) is a multi-purpose target designed to challenge gunners with its agility and speed. The $350,000 fiberglass-hulled boat measures 50 feet long. A quartet of Yanmar 480 HP diesel motors and cigar-boat shape allow the FACT to reach a cruising speed of 50 knots and top out around 58 knots with a range of roughly 400 nautical miles. Like the QAT-35, the FACT is radio controlled during live fire exercises using the same command links, and it too can be augmented to increase its Radar Cross Section (RCS), RF/IR signatures, deploy electronic countermeasures, and record Miss Distance Information. Packing 46 knots (52 MPH) of speed into a hull length half that of the FACT or QDT-35, the 26 foot HSMST is fast and incredibly maneuverable—ideal for shallow water exercises. The HSMST shares its hull design with harbor patrol boats and is outfitted with a pair of 200 HP outboard engines. As with the previous two, the HSMST can be augmented to adjust its threat signature. Think of a remote controlled Sea-doo. That's the Ship Deployable Seaborne Target (SDST). It can be launched either from a Naval vessel or from shore and jams over the waves at 20 to 49 knots. Its small stature and high top-end speed make the SDST a valuable resource in everything from surface gunnery exercises using the ship's weapons to aerial gunnery using ship-launched helicopters to more austere visual/radar acquisition practice. At 260 feet long, the Mobile Ship Target (MST) is the Navy’s largest seaborne target. Its flat deck can be decorated with shipping containers or the entire superstructure of another ship, in addition to the standard RF/IR/radar augmentations. to accurately simulate a threat scenario. It putters about at just 15 knots thanks to a pair of 671 HP CAT 3412 DITA engines, but its size allows it to withstand waves that would swamp its smaller brethren. 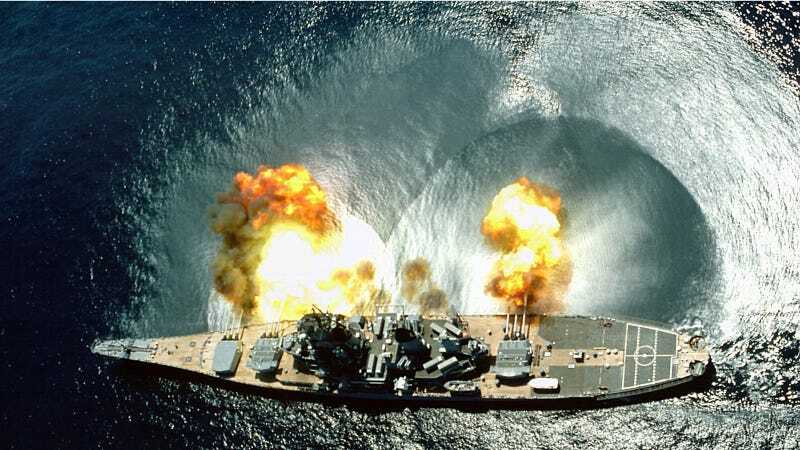 The Navy would go broke if it used nothing but powered targets in its live-fire exercises—even a missile sans its high-explosive warhead can do a fair amount of damage to their fiberglass hulls. Instead, the surface craft tow barges with targets trussed up on their decks. The LCMT is the latest in towed target technology. It's a modular barge built from easily and inexpensively replaceable pontoons and scaffolding but the real genius of the system is its adaptability. Instead of having the Williams Sled for missiles and gunnery shot, the Improved Surface Tow Target (ISTT) for direct fire, and the HARM barge for fighter jet-launched High Speed Anti-Radiation Missile tests, a single LCMT can do it all.